Publicity Stills of "The Kallang Wave"
The Kallang Wave is a reason enough to celebrate. In our budding film industry where movie productions are still limited, documentaries are harder to come by. We've a handful which made it to festival or special screenings last year, like Tan Pin Pin's excellent Singapore GaGa, James Leong and Lynn Lee's Passabe, Grace Phan's A Hero's Journey, and Eng Yee Peng's Diminishing Memories. 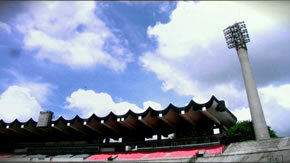 While Passabe and A Hero's Journey looked at events outside of Singapore, and James Leong and Lynn Lee continue with their new documentary Homeless FC set abroad, now in Hong Kong, The Kallang Wave follows in the footsteps of capturing a topic of local flavour, and one which documents a monument that is going to pass on soon. Like Yee Peng's Diminishing Memories, which was an excellent look into an era and lifestyle long gone, I thought The Kallang Wave would, without a doubt, be about our fabled National Stadium at Kallang, which will be making its way for the new Sports Hub. Directors Yanfeng Lee and Hanafi Ramdan had other ideas which evolved along the production, and what was to be, became The Kallang Wave, a documentary that slowly but surely shifts its focus into one of the passions of our nation, synonymous with the stadium which had seen its glory days, and its failures - that of the Singapore football team. The film does not shy away from its supposedly very fan-based and niched theme, and it offers a look into the current state of football affairs, starting with a blast from the past from old, grainy, hard to find VHS sources. But it is indeed their relentless uncovering of such gems in various archives, and with permission extended by the Football Association of Singapore (FAS) to cover local current footballing events, that they've managed to come up with something special, straight from the heart. With every Singapore football story, there is no let up in retelling the glory days of the the 70s, and culminating with the Malaysian Cup tournament glory of 1994, before Singapore pulled out of the competition to set up our own S-League. Everyone has their favourite Malaysian Cup story to tell, and no doubt this can be felt through the various interviews with players and officials, both past and present, and the ordinary man in the street. But it's not just a plain retelling, as The Kallang Wave goes deeper and attempts to explore the fabric and psyche of Singapore society, The idea that the stadium is a melting pot for everyone, sans race, language and religion, to rally behind a national team in its quest for success, is a powerful one, and one which is clearly demonstrated and attested to by anyone who had attended a football match before. The film also keenly opened up the usual finger pointing amongst officials, players, fans and the media, and to see each group defending their turf and passing the buck of blame, is indeed amusing, but at the same time, you know it's inevitable as the webbed relationship amongst all the stakeholders is so intricately connected, it boils down to the perennial chicken and egg situation. Made by first time filmmakers, this film naturally does have its flaws, such as the pacing which sagged halfway through, and at times, seemed slightly lost in its direction given the ambition and magnitude of the material at hand. However, you could feel the passion that the filmmakers had for their initial effort, especially touching on a topic so close to their hearts. Also, given that the movie took years to develop, it's dated way before the Lions' latest victory in the Tiger Cup tournament earlier this year, But if there's a merit to this documentary, it's for showcasing a viewpoint that probably wouldn't have made it to the mainstream media - and that powerful scene alone (which I shan't even describe) is worth the ticket price. Local football in film is relatively new, with the maverick and popular short TakGiu making its rounds on the internet,. 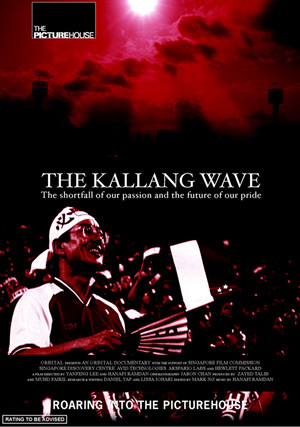 And now with The Kallang Wave making its debut in The Picturehouse's Happy 1st Anniversary Film Festival, this is definitely one that any self-proclaimed local football fan must see, filled with interviews from heroes past and present, such as Fandi Ahmad, David Lee, Quah Kim Song, and Kadir Yahya.